I try not to look at other people who started their healthy hair journey at the same time as I did to compare to see if their hair is longer or shorter than mine. All of our heads are different and will thrive differently. I would be honest to say that in my first year I was obsessed with length but now I just want the healthiest hair with the added bonus of length. Everyone’s hair grows but it all needs some TLC for it to thrive. I experienced one set back and thinning which caused me to trim 3 inches off both times but my hair felt and looked better. Hair grows so no need to hold on to stringy ends. I have been on my healthy hair journey for three years and I must say it was the best decision for my hair. Although I got length quickly in my first year, my ends appeared very thin. It wasn't until 2014 did my hair start to gain thickness which resulted in me cutting off a lot of those thin ends. I can now be proud to wear my hair down. My ponytail in the first year looked disgraceful. My ponytail started to thicken up after one year. Three years later and I’m proud of my ponytail. 2014 was when my hair really thrived after cutting off thin ends. Its good to look at comparisons like these to see where you came from and where you are at now. I am finally proud to wear my hair down without feeling uncomfortable about my ends looking thin and unhealthy. Again my hair blossomed from 2014 with respect to thickness and length. Things can only get better from here. I've learned what my hair loves and hates and I always do a strand test before my wash day to see what my hair needs. My advise to anyone now starting their healthy hair journey is not to be discouraged because good things take time. Take lots of pictures so you can see the comparison of your hard labour. 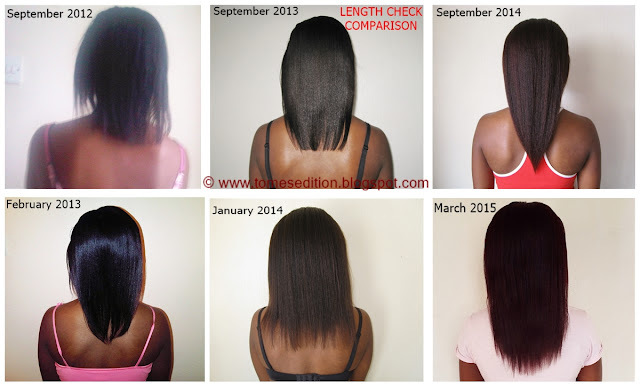 How long have you been on your healthy hair journey? You did an excellent job at consolidating photos with similar poses so that we can see the true progression. I never seem to take photos with the same poses so it's sometimes hard to see. That's not intentional, I just never can do the same one twice. Your journey in pictures is very telling that you're doing everything right! Your hair looks thicker and is longer. The shine has always been there so not much have changed there but the overall health looks on point these days. Great work! Thanks Jay, i tend to keep it simple! Wow and more wow, one of the best hair transformations you should have your own hair commercial. What would you say are the top 3 contributing factors for the thickness of your hair? Is it texlaxing the hair, JBCO castor oil and stretching the relaxer? Love the thickness and growth. My inspiration. Texlaxing has played a major part and using JBCO regularly and stretching my relaxers have also helped. You hit the nail on its head. 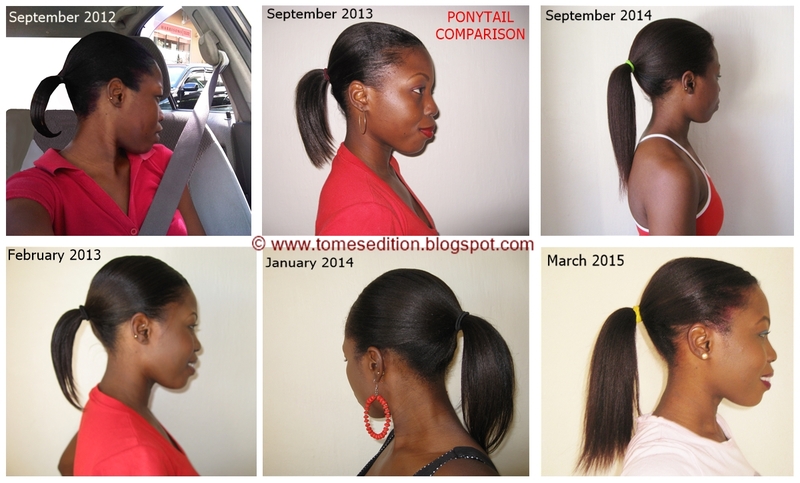 I love how you took consistent photos throughout your hair journey, Tomi. You can really see how much your hair has grown or has been benefiting from a healthy hair care regimen. Your hair looks so healthy and gorgeous! So proud of you and your progress, Tomi! You have inspired me as well! Thanks Miss Dre, I tend to do that to see how well my hair is doing in different areas. Great progess, Tomes. A picture is worth a thousand words. Your regimen is working quite well for you. I also started my hair journey 3 years ago and I've learned so much about my hair. Thank you. I just keep it simple, no fuss. The proof is in the pictures! Congratulations, your hair has truly thrived over the course of your HHJ, Keep up the great work love, looks gorgeous! 3 years already!!! Your hair has really thrived and the ponytail is simply amazing. Happy 3 years!!! Where has the time gone! Your hair loves awesome! You have achieved so much! Time is certainly not waiting on anyone, thanks Yvonne! Wow your hair has gone on an exponential growth path but m sure as your post title says, your healthy hair practices paid off. Congratulations Tomi, your hair journey is inspiring! I am so proud of you honey. You have kept your hair so healthy. You knew when to trim or not to trim. My hair is doing great, but I am still worried about split ends and dry hair. You inspire me. Kisses! 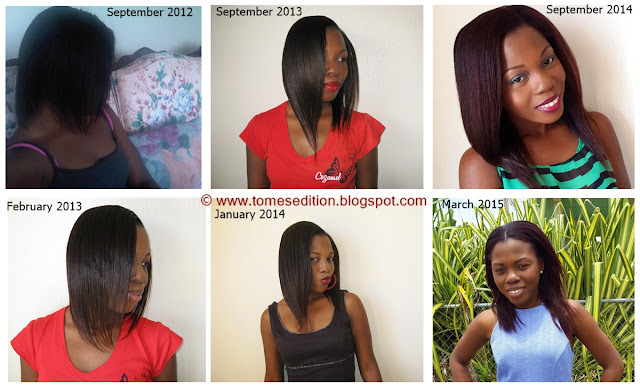 Tomes, happy healthy hair journey. Your hair has truly come a long way and you've shown that relaxed hair can definitely grown long and healthy. Can you please explain how you do your strand test each week is it on dry or wet hair? HI Mzddann, I actually do both. To decide what to prepoo with first i do it on dry hair and also depends on how my hair feels during the week. I simply stretch the strand, if it pops right away i know i need some moisture. If it takes forever to pop, i know i need some protein. If it stretches and return backs to its natural state (when wet) i know my hair is balanced.